Not so much a music zine as a collection of articles on countercultural movements and conspiracy theories. 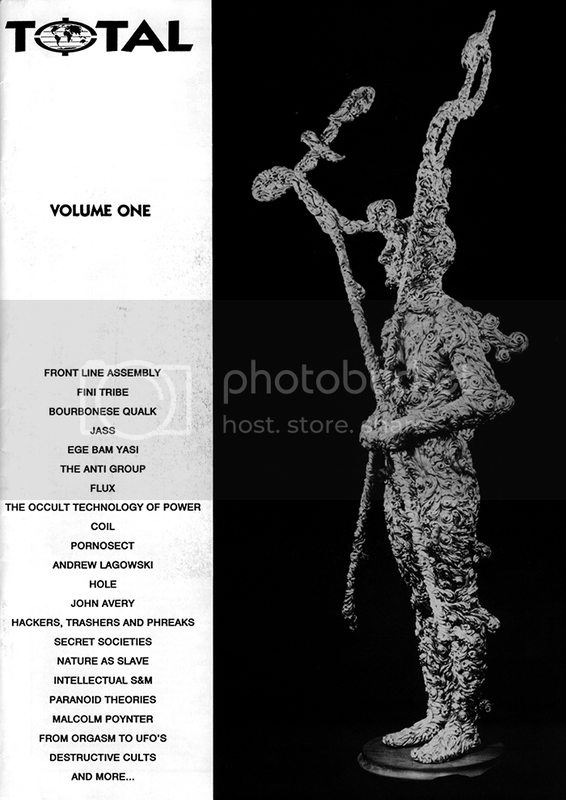 The cover lists Front Line Assembly, Finitribe, Bourbonese Qualk, Coil, Lagowski, etc. But aside from a couple fullpage art collages for some of them, these artists only appear on the accompanying cd. The one exception is an 2 page layout containing what i'm assuming is Adi Newton's TAGC manifesto, with The Anti Group appearing on the cd as well. Because God Told Me To Do It. Hi, I edited TOTAL (which ran to two editions, number 2 being a 160 page book and CD) and compiled the CD. It was a long time ago now and although I can't vouch for what Solielmoon would say about it being up for download I personally think that blogs like yours are what music blogging should be about, establishing a sense of history in an area that is somewhat overlooked. Copyright Infringement, well, that's a whole new ball game. Everything I did over a ten year period is now out of print (I ran a number of labels) and I'm intrigued and pleased that there is still an interest in the back catalogue. I'm in the process of compiling / designing a label history site and will add ye to my links page. Oh I also wrote for 'Music From The Empty Quarter'. Awesome zine. Thank you very much for posting it. I don't suppose there is any way to get vol. 2? That would make me very very happpy. Keep up the good work.